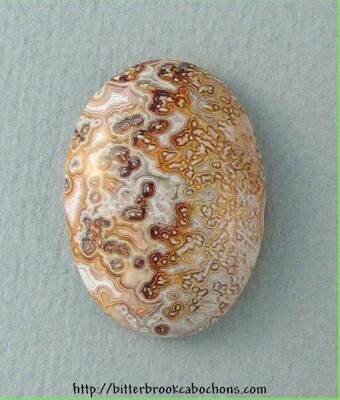 This is a simple small Lace Agate oval, from Mexico. Gold & brown colors, and pretty lace! Gloria at Wire Treasures is going to transform this cab into a pendant. 23.5mm x 17mm x 6mm. Weight: 18.40 carats. Do you like Lace Agates? Click here to see all of the Lace Agates on the site! You are visitor number 28 to this page this year.